Our arrival into Croatia is a bit of a blur. 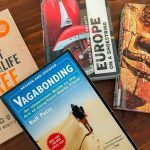 If you have read my previous diary on Bosnia & Herzegovina you will know we were battling a bit of a stomach bug. It really was touch and go if we travelled or not. We did not get on the morning bus we planned, but made it on to a later one in the afternoon. 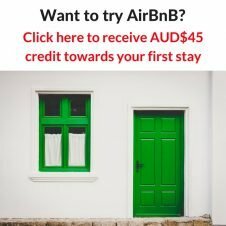 The thought of having our own apartment instead of dealing with the mortification of a shared bathroom convinced us to travel. Where we were staying in Split was only a couple of hundred metres from the bus station, but we used every last ounce of energy getting there. By now I had eaten nothing for 24 hours, and had been surviving by sipping Coca Cola. Neither of us felt like eating, so we collapsed in a heap and slept. The next day was not a lot better. I was no longer spending all my time in the bathroom, but I was still exhausted. For the whole day we ventured no further than the grocery store. We made a vegetable soup, and that was about all our stomachs could handle. Finally, on our last day in Split, we were feeling better. We ventured out into the streets and had a walk around. We really felt disappointed that our time here was interrupted by being sick, so changed our plans around to come back. 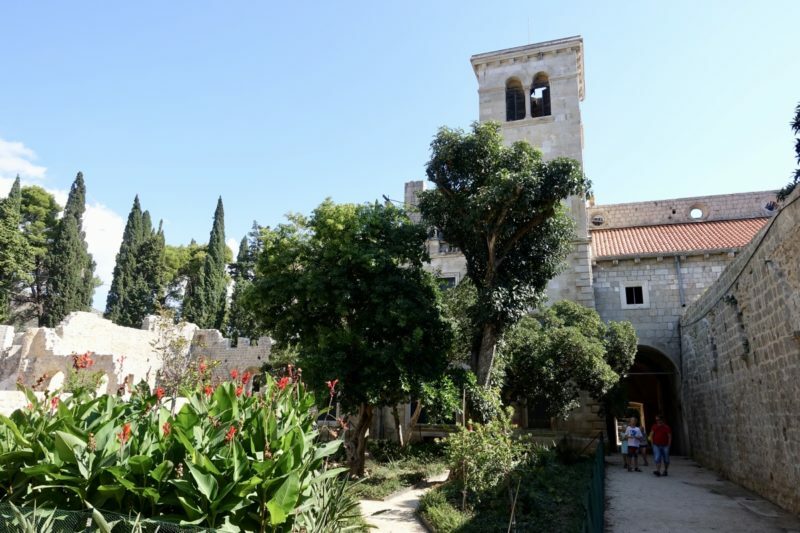 Instead of spending a few days on Hvar, we would stay in Split and just do a day tour. This was the first time ever we have had this sort of stomach bug from food. We didn’t get Bali belly, and we chomped though street food in Malaysia, Thailand and Vietnam. The only time I have used bottled water for brushing my teeth was in Vietnam too. We were long over due! 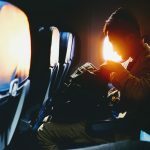 Another one of those joys of travel that seems to happen to everyone at some point. While we felt pretty bad, in reality we got over it quickly and all was good again. Our bus to Zadar was at a nice civilised time and we arrived early afternoon. We felt energised and ready to explore after our days of confinement. We meandered through the narrow cobbled streets, stopping at cute cafes for coffee, wasting away the whole afternoon just enjoying the town. As the sun set we made our way down to the seafront to enjoy a magnificent Croatian sunset. 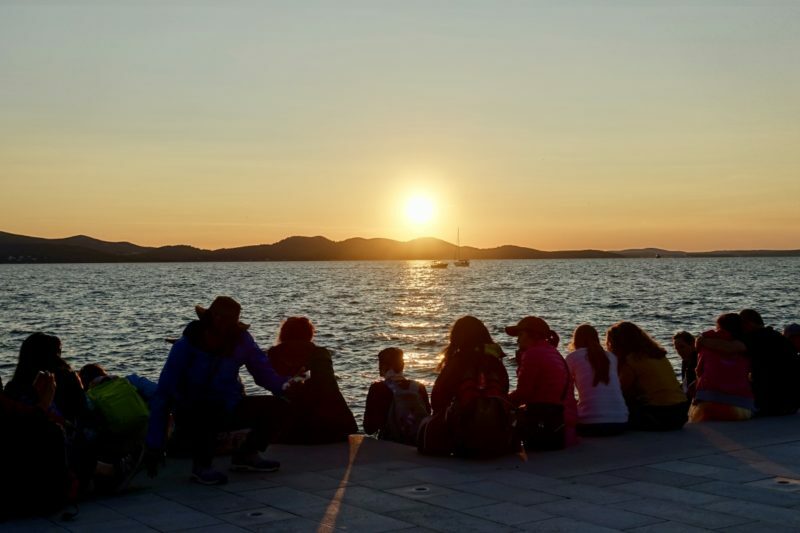 Zadar is the perfect place to use as a base for a day trip to Plitviče Lakes National Park, best known for it’s hundreds of spectacular waterfalls. From Zadar there is absolutely no need to organise a tour, the public buses go there a few times a day. 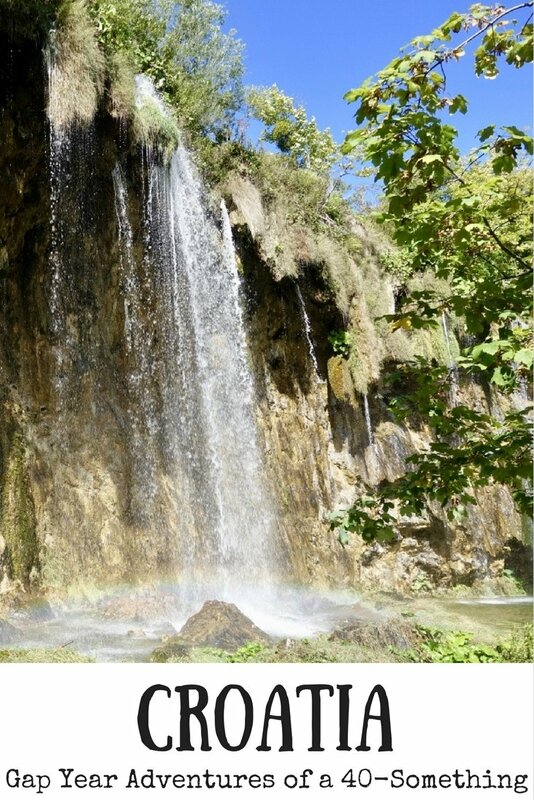 The Kraviče waterfalls are just beautiful. 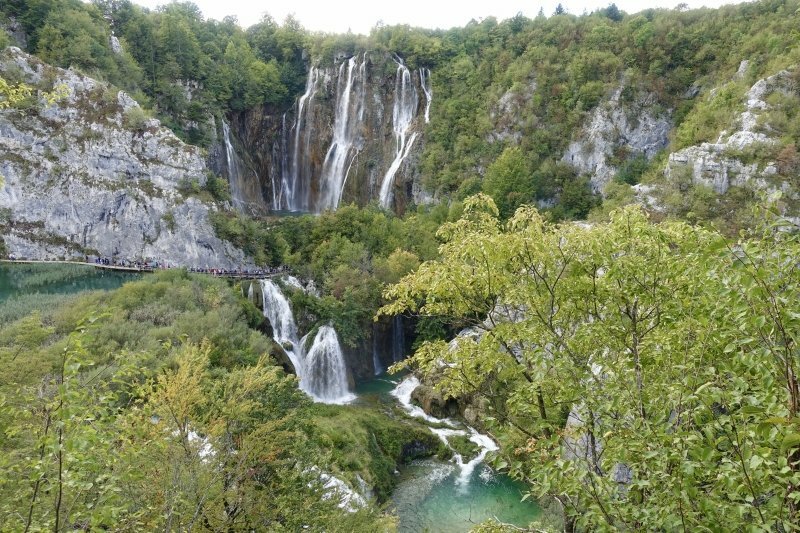 We had been to see the Kravica waterfalls in Bosnia & Herzegovina only the week before, so I was a bit concerned that this would just be more of the same. Not even close! Plivitče is much, much bigger, with so many more waterfalls. 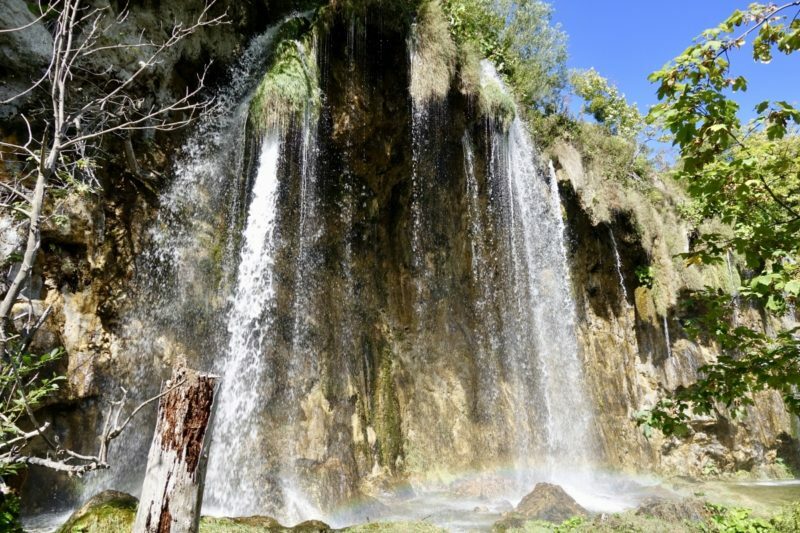 But you cannot swim here, so Kravica is still the place to go if you would like to swim under the waterfalls. Plitviče is just stunning. The water is that wonderful blue/green colour I absolutely love. 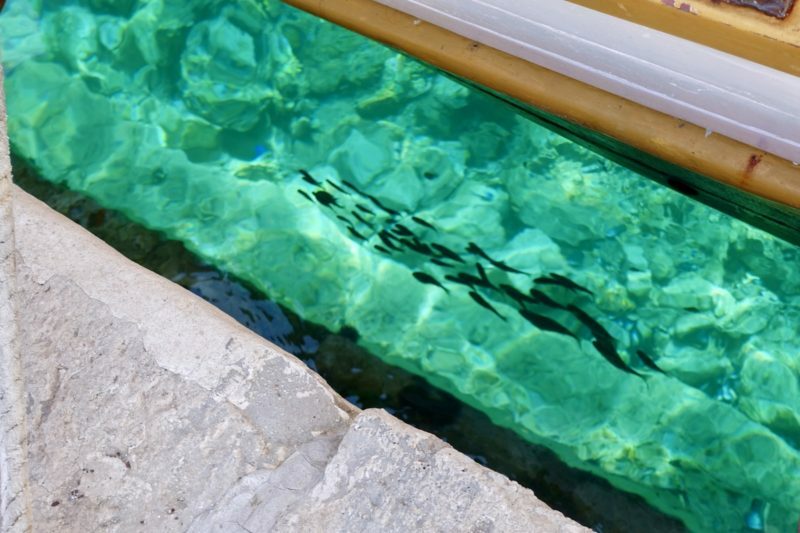 It is so clear, and there are thousands of fish swimming around. The only downside was the busloads of tour groups that would often clog the boardwalks. To get around this, give yourself plenty of time and do the longer hikes. They are just as beautiful and way less crowded. If I were to visit again – and I’d like to in winter when it is all covered in snow – I would stay at Plitviče overnight to get access to the park earlier and later than all the day trippers. 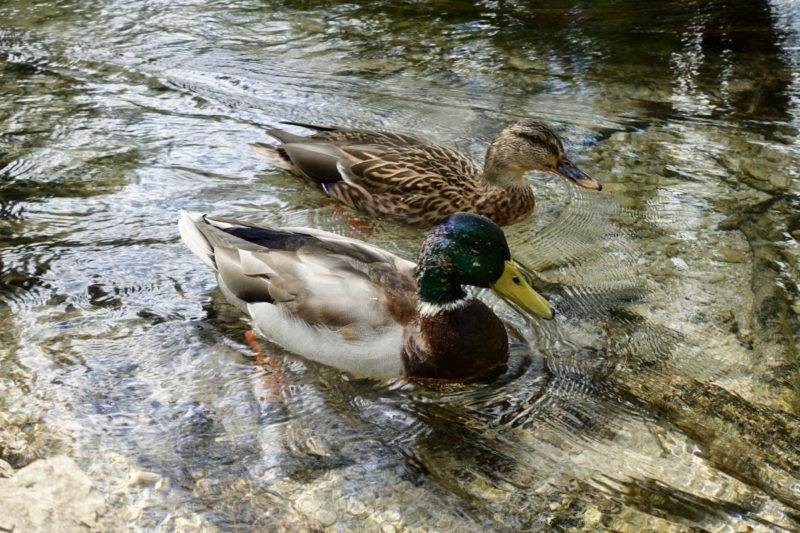 If you are keen for more information on visiting Plitviče Lakes National Park, I have written a a post all of it’s own. There are a whole pile more photos and information on how to get there by bus from Zadar. 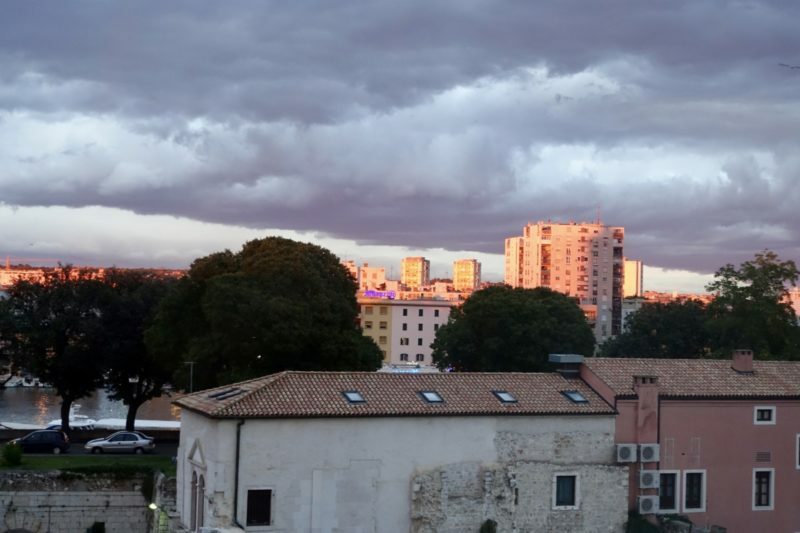 On our arrival back from Plitviče we were resting in our room before dinner when I noticed the light outside had significantly changed. All of a sudden the sun had appeared through the overcast skies, just in time for sunset. I grabbed my camera and raced towards the seafront. We didn’t quite make it there in time, but did get a couple of nice photos as we made our way there. The famed Croatian sunsets were amazing me already. Our last day in Zadar was again spent enjoying the town. I just can’t get enough of these old Roman towns with their cobbles and squares and cute little cafes. I enjoyed an (expensive) Aperol Spritz to really bring back that Italian feel. It was late in September though, so not quite hot enough to truly remind me of our time in Italy. Just before sunset we made our way down to the sea organ on the foreshore. This man-made area has holes underneath it so when the waves come in and out it makes a musical sound. It’s a little soft and eerie when the sea is calm, but with stronger waves or when a boat goes past, it is much more dramatic. Not far from the sea organ is an art installation on the ground. It’s a model of the solar system over a large area. The sun is covered in what looked like solar panels, and once the sun goes down, it lights up. It wasn’t quite dark when we left for dinner, and I was going to come back again after we had eaten, but I completely forgot about it! 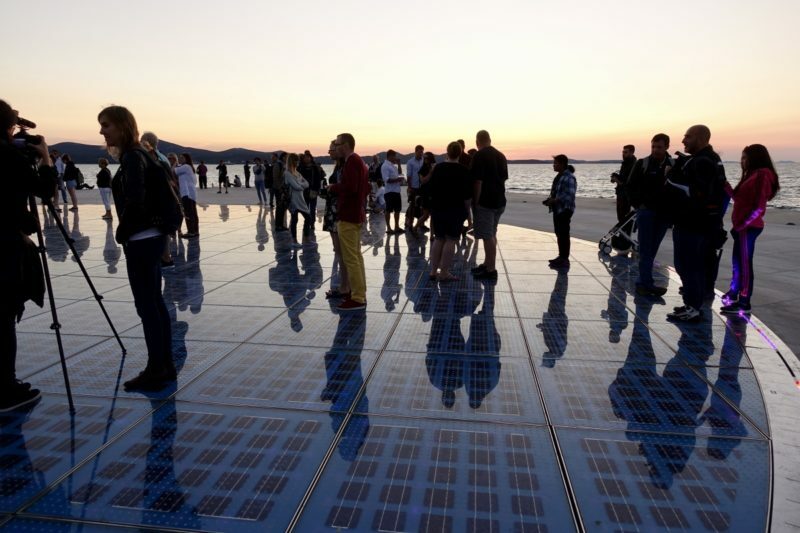 The Greeting to the Sun in Zadar. The disk on the ground lights up all pretty colours, but it wasn’t dark enough to see it in this photo. We forgot to go back later to check it out. Back in Split again, and this time I was determined to look at the town. We were staying right in the Old Town, on the top floor of a building that is over six hundred years old. 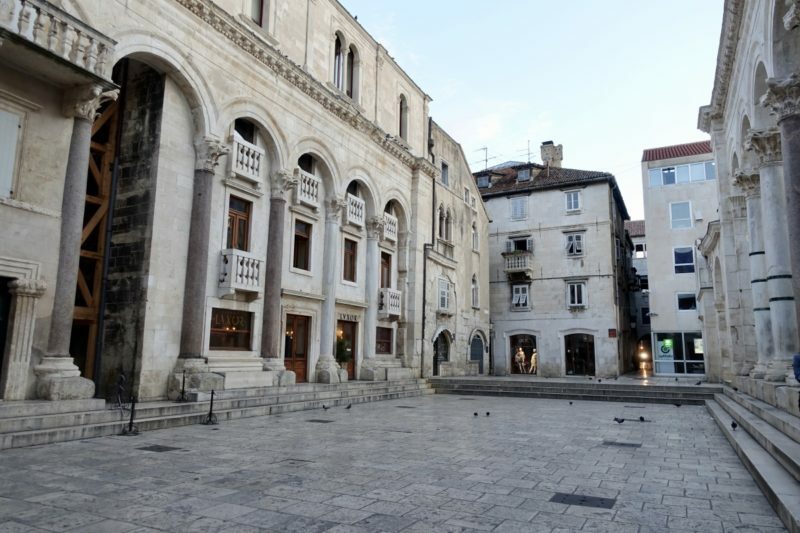 It was in part of Diocletian’s Palace, right near the Peristil. During the day we had the sounds from a male acapella group drifting in through the window, and in the evenings, live music was played in the square. At all sorts of times during the day the cathederal bells would ring drowning out all the other sounds. We were well and truly right in the middle of everything. The Split Peristil, which is usually full of people – it was before 7am when I took this! 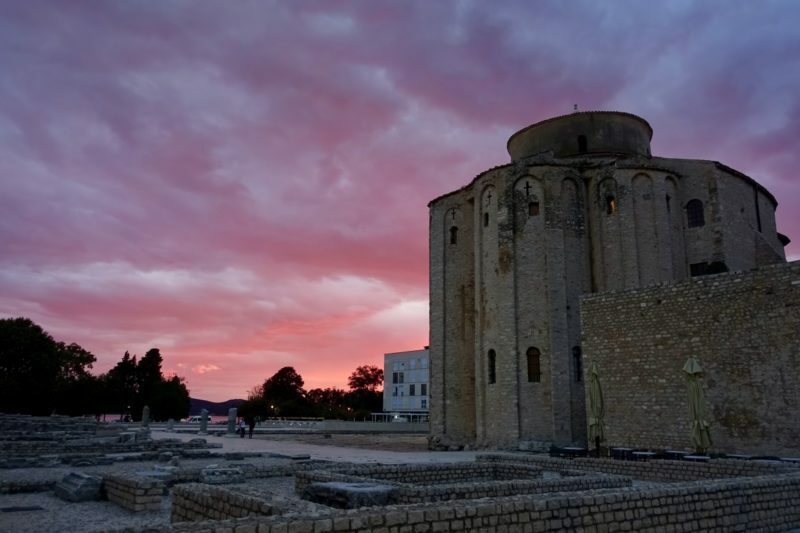 The Split clocktower that rang it’s bells many times during the day – and night! One of the first things we did was a walking tour of the old town. Unfortunately there are no free tours in Croatia, it is forbidden by law, so we had to find another tour. We only chose a brief 90minute walk, and as it worked out, we were the only people doing it. The weather was a bit inclement, and as we made our way to the meeting point it was bucketing down. Luckily it stopped for most of our tour, and when it was raining it was very light. As we walked around we learnt about the Roman history, saw the Jewish areas of the city, and then the Austrian influences too. 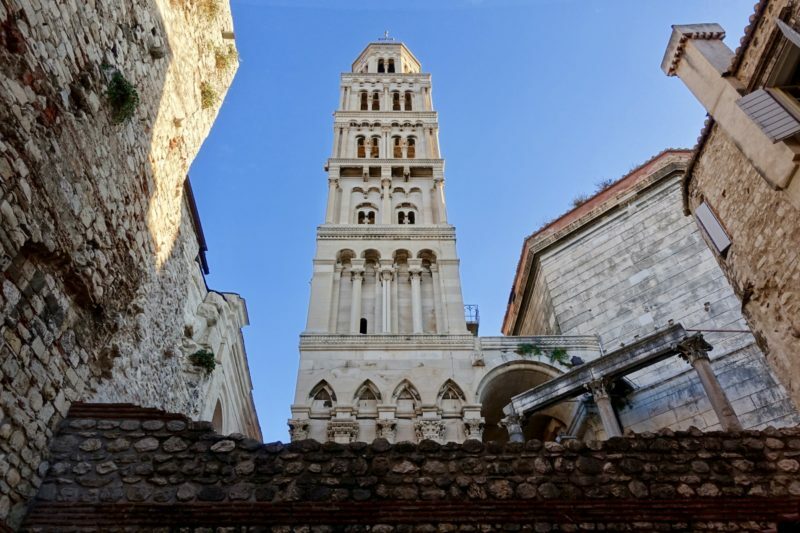 While our tour wasn’t a dedicated Game of Thrones tour, that is now so ingrained into Split’s modern identity that it was pointed out along the way. We also saw the third narrowest street in Europe. No wonder the crowds seemed overwhelming in the tiny streets. 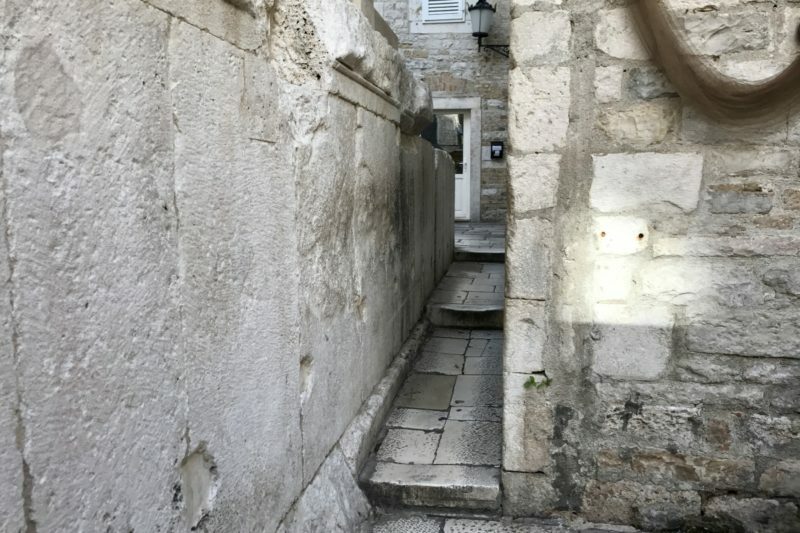 The third narrowest street in Europe! This is why it’s hard to get around Split when it’s crowded. 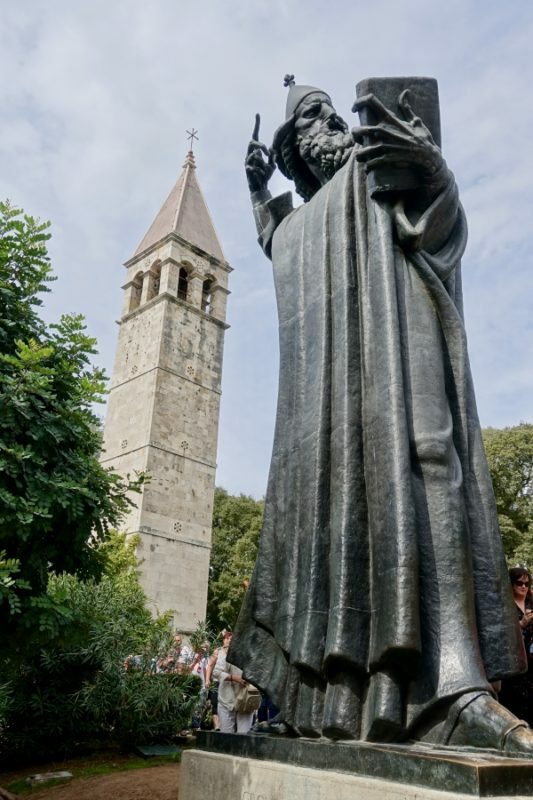 No, it’s not Gandalf, it’s Gregory of Nin, a medieval bishop who opposed the Pope and started offering services in Croatian, allowing even those who didn’t know Latin to participate. 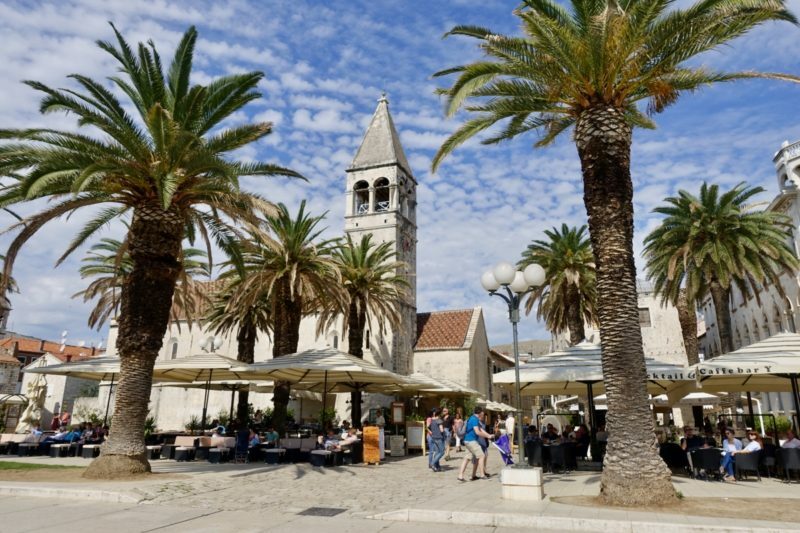 A good daytrip to do from Split is to visit Trogir. Yet another old Roman town with walls, fortresses and narrow cobbled streets. 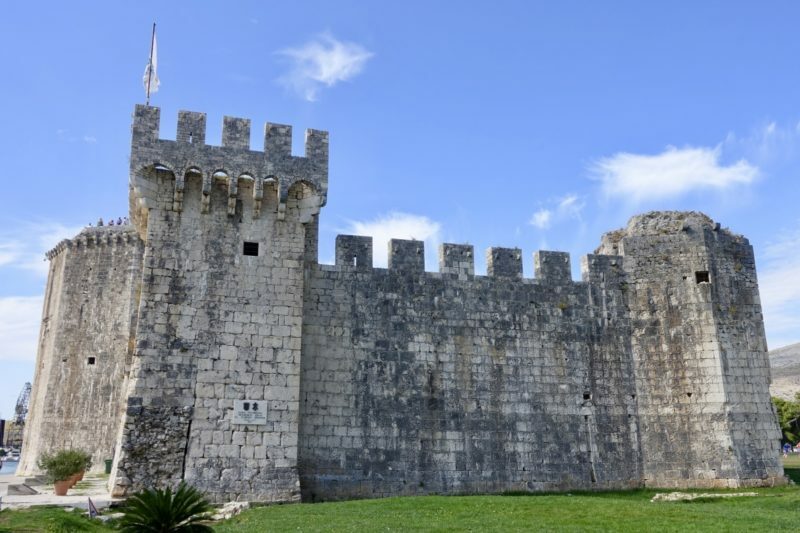 Trogir also features in Game of Thrones as the city of Qarth. 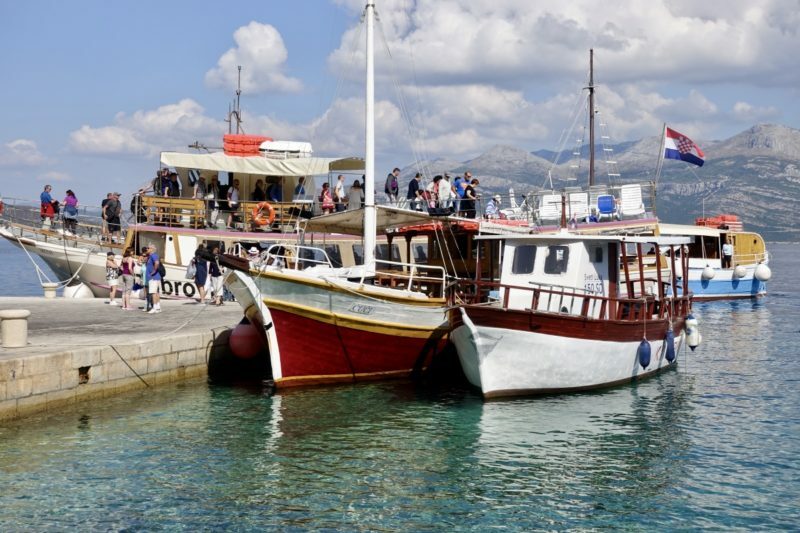 While it is possible to get a bus to Trogir, or even book a tour, it is cheap and easy to get on a ferry right in the centre of Split. We had perfect weather and the 45 minute trip was as enjoyable as the time spent in the little town. During the walking tour I had struggled with rain and crowds to take any photos, so when I woke up at 6am I decided to head out for a walk around the town. It was absolutely fatastic walking around as the sun was coming up. Only a handfull of other tourists were doing the same as I was, the other people were all locals up and preparing for their day. I keep telling myself I need to do this more often. Split was a town we really enjoyed just being in. The crowds were a little overbearing, but the atmosphere was great. We enjoyed just sitting in the squares and people watching. We sat on the foreshore in the sunshine We hung around in the Peristil listening to the music. We didn’t end up getting to Hvar. Our apartment host told us that it had mostly closed down now that the summer was over so we chose not to go. That will have to wait until our next trip, because I am sure we will be back here one day. We had been really looking forward to getting to Dubrovnik, and not just because it was our first washing machine for quite a while! We were meeting up with some of our Australian friends Rob and Tavia who had planned a holiday here and our timings co-incided. 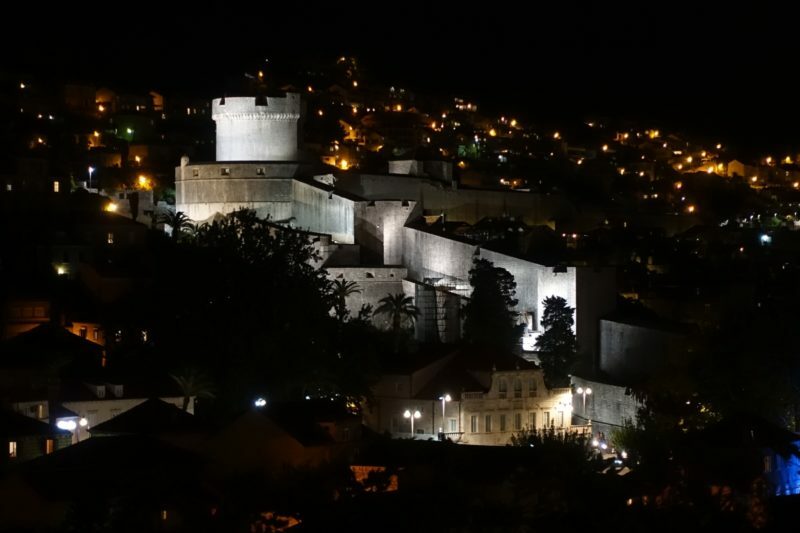 Dubrovnik was also to be the longest stay anywhere on our trip so far. It was going to be nice not packing up and moving for six whole days. 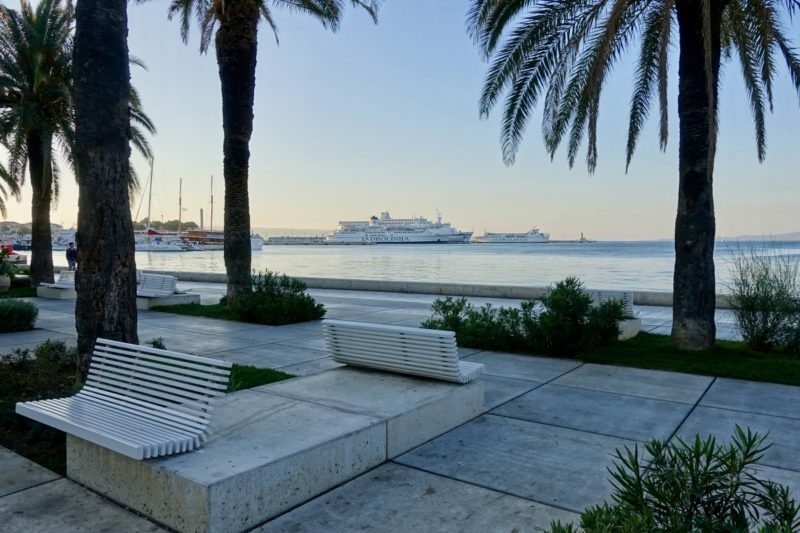 We were staying about a half an hour walk from the Dubrovnik Old Town, but we were close to the port/bus station area and not too far from the Lapad area that has lots of restaurants and bars and a beach facing the sunset. We were told by our AirBnB host that this was the area that the locals would go and eat to avoid the crowds in the Old Town. Simon and I had arrived a day before our friends, and we wandered down to this area to check it out. We planned an evening down here later in the trip to watch the sunset. Our first proper outing was into the Old Town. We went in about mid morning and spent some time wandering through the streets. I have mentioned Game of Thrones before, but here is where we really started to see familiar places. I had to admit though, I am only an average fan. I’ve only seen the first four seasons. Simon has seen more, and being much more into tv/movies than I am, it was him that recognised most of the places. The Old Town though was overwhelmingly busy! I can totally understand why the locals are over the cruise ships. We could see four ships in port this day, and it was not fun to try to get around. The streets were much wider than in either Split or Zadar, but still they were clogged with tourists. 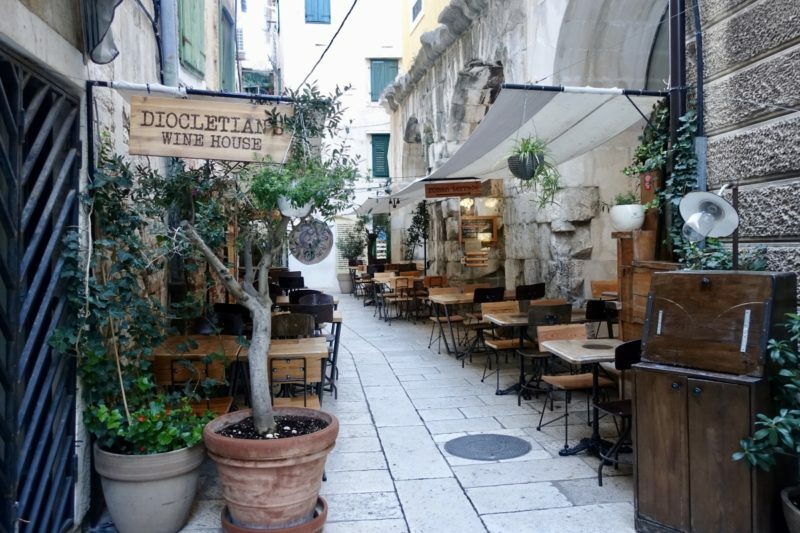 By the time we had a quick look around and grabbed some lunch, we were well and truly ready to get out of there and enjoy our quieter part of Dubrovnik instead. 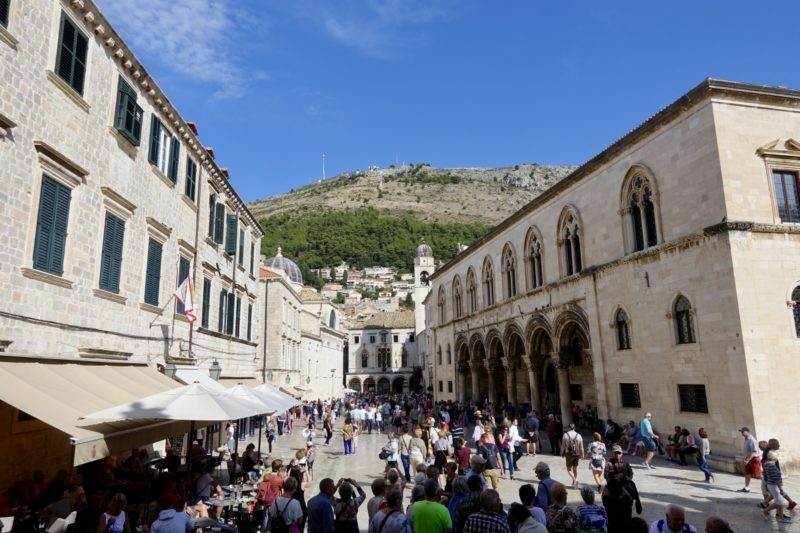 Some of the crowds of the Dubrovnik streets. This is one of the wide main streets, the narrow streets were shoulder to shoulder. The next day we braved the Old Town again, but only to pass through to where the ferry to Lokrum Island leaves. It’s only a fifteen minute ride over to this island just off the coast. Lokrum Island is now a reserve. 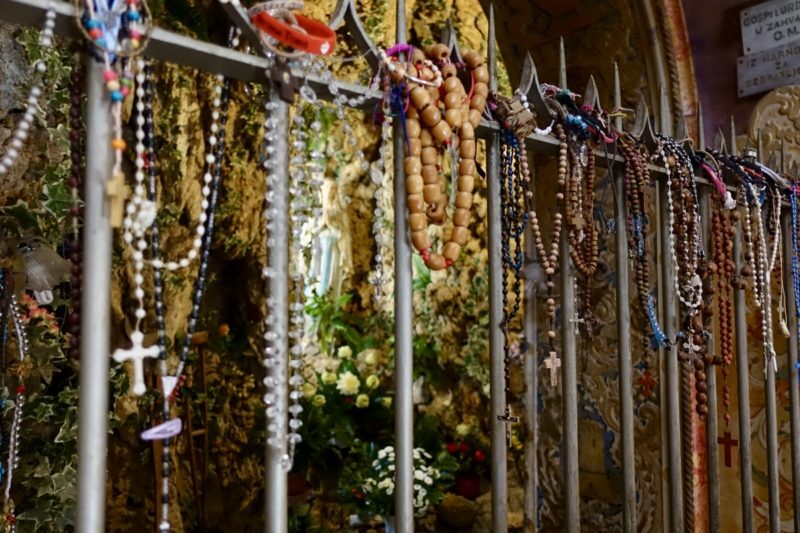 It was originally the location of a Benedictine monastery (which you can explore today) but was abandoned in the 1800’s. When they left, local legend says they cursed the island and anyone who owns it in the future. And it is true that all subsequent owners, including members of the Hapsburg family, all met with tragic deaths. 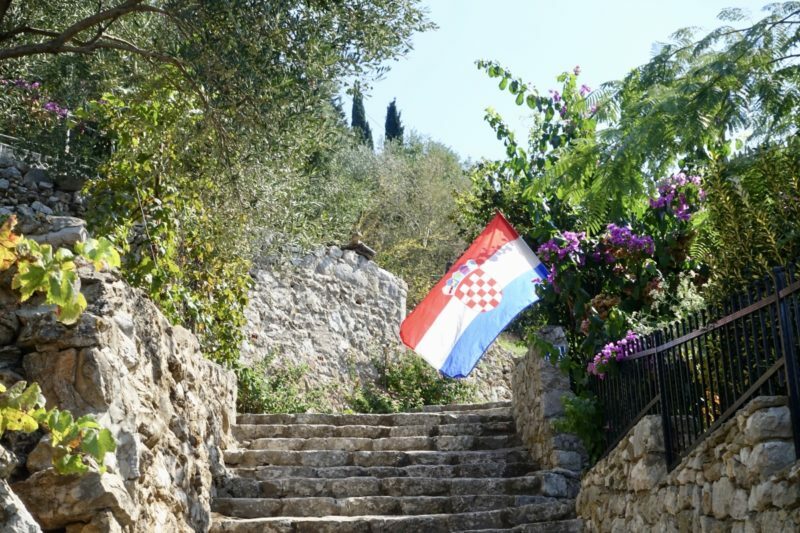 Now it is owned by the Croatian country – more than one person mused that maybe this is what is behind all the issues they find wrong with their homeland. Apart from the monastery, there is also a strange sinkhole on the island, called the Dead Sea. We did not go swimming in it, but many others were. Apparently it is quite salty, like the actual Dead Sea. There is a nice walk up to a fort on the highest point of the island which provides great views in all directions. A few of the trees need a trim though to get the perfect view back over the Old Town. Everywhere we looked there was wildlife. Mostly rabbits, but peacocks were parading around too. This time of year they are still growing back their tail feathers, so no spectacular show, but they still have the attitude that goes along with it. Lokrum Island is now a botanical garden and is protected by UNESCO, so dogs are not allowed on the island. 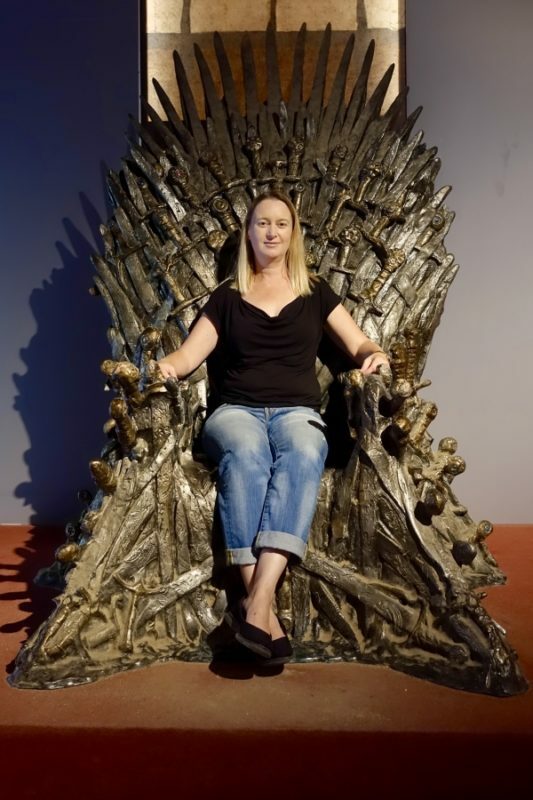 While on the island, inside the Benedictine monastery, there is a copy of the Iron Throne from Game of Thrones, so this is the place to visit to get a photo sitting in it. There is no charge, and no line up! We literally just had to wait for the people already there to finish taking photos and it was our turn. When we left, no one else had come along. There is a shop in the Old Town that charges you for photos on the throne, but this is another option. The Saturday we were in Dubrovnik was the AFL Grand Final back in Australia. For those of us in the south of the country this is probably the biggest sporting day of the year, especially if the team you support is playing! Out of all of us, only Tavia’s team was in the Grand Final, but Simon was also keen to watch it. We couldn’t find anywhere to watch it live – kind of fair since it was played at 6am Croatian time – but we did find a sports bar who would replay it for us in the afternoon. While the others spent the morning avoiding the internet, I didn’t care so much and looked at the scores. I then had a lot of fun making up all sorts of things about who had won and lost for the rest of the day. We made our way down to Lapad to the sports bar, and they pulled out all the stops to find the UK channel that would be replaying it. The only issue was that the time we had read was UK time, so we were an hour or two early. Our plan had been to watch the game, then go see the sunset. With the later start, we would now miss it. The game itself was also not that great. It was a one-sided affair that left Tavia’s team the losers. We drowned our sorrows and headed off to dinner at a place we had passed on our walk. Our luck was not to change, as the place was now closed, and we ended up eating in a local tavern. Basic food, but at least we ate. We had an early morning the next day as we met up with our boat to go on a day trip to the Elafiti Islands. This archipelago is just to the north of Dubrovnik and we saw daytrips to them advertised everywhere. We picked a cheaper option which was reflected in the food and drinks we were given on board. The food was basic and the wines were average at best, but I guess that’s one way to stop people over indulging when it’s all inclusive! 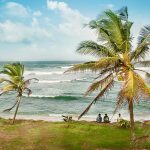 We visited three islands, all of which had nice little eateries, some great scenery and some nice little walks. This area is just so picturesque. I could not stop talking about how clear and pretty the water was. The colours were just amazing in some places. We picked up some nice wine from a little local place to take back with us for dinner that night. Our last day in Croatia was spent on boring stuff. Sleeping in, organising our ongoing trip, another load of washing! 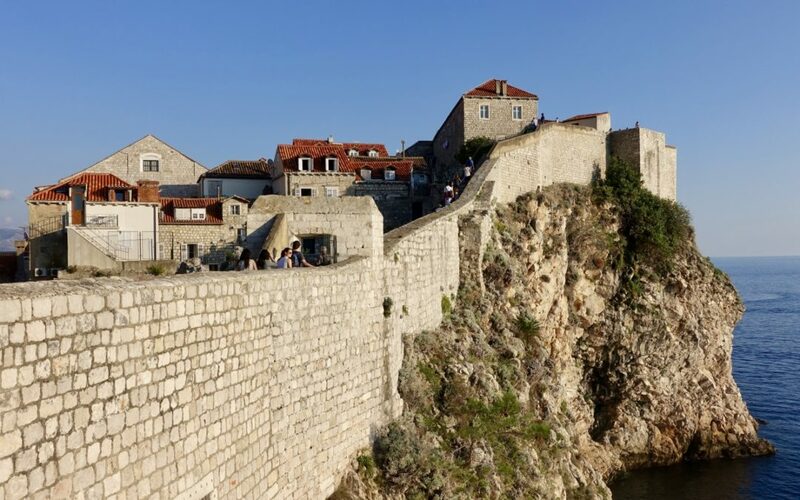 Later in the afternoon we made our way back to the Old Town to do that one thing all visitors to Dubrovnik do – walk the walls! We had chosen to go about an hour before closing on purpose, hoping to avoid some of the crowds we saw in the earlier parts of the day when previously in the Old Town. It was definitely less crowded, but there were still plenty of people walking around. An hour was probably not quite long enough, and towards the end we were hurrying along so we could get to dinner. I would allow 90 minutes if I was to do this again, to allow plenty of time to stop for photos. I can imagine that if it is during the earlier, busy part of the day, two hours might even be needed. Tavia and I then headed off to do the Ghosts and Mysteries Walking Tour. The tour started with a visit to an old cemetery and wound it’s way through the Pile area, ending up just inside the old town gates. Our guide Marija was fantastic, and her delivery of the stories really added to the tour. 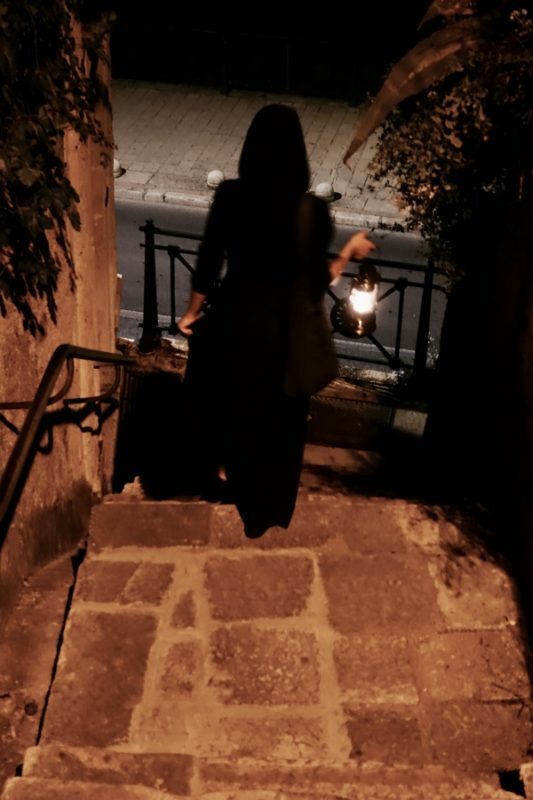 She came dressed in a black, hooded cloak and carried a gas lantern to light the way. 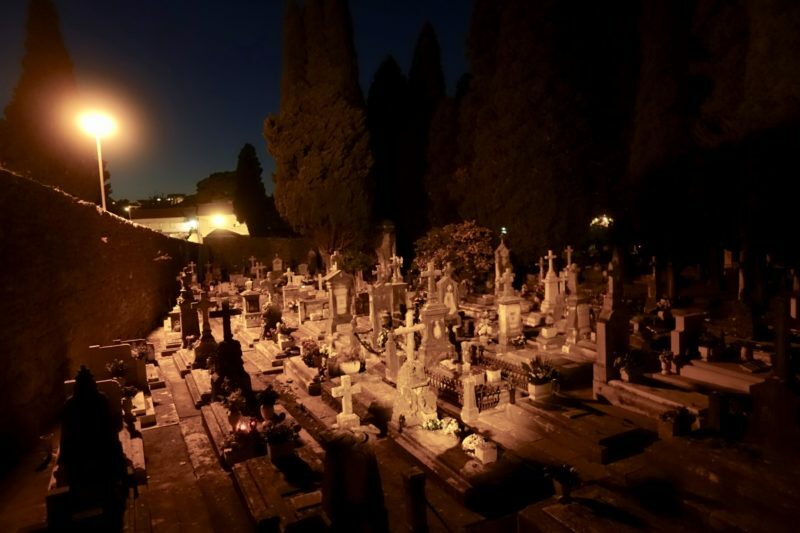 This is not a ghost-hunting tour, but more about the macabre and gory history of Dubrovnik. Public executions, the Black Death, Freemasons and local legends all combined together into a fun and interesting evening. There were even one or two Game of Thrones mentions too. 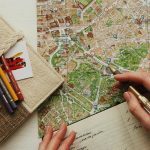 If you are looking for something a little bit different to your usual walking tour, then this is absolutely for you! Marija setting the mood with her lantern. 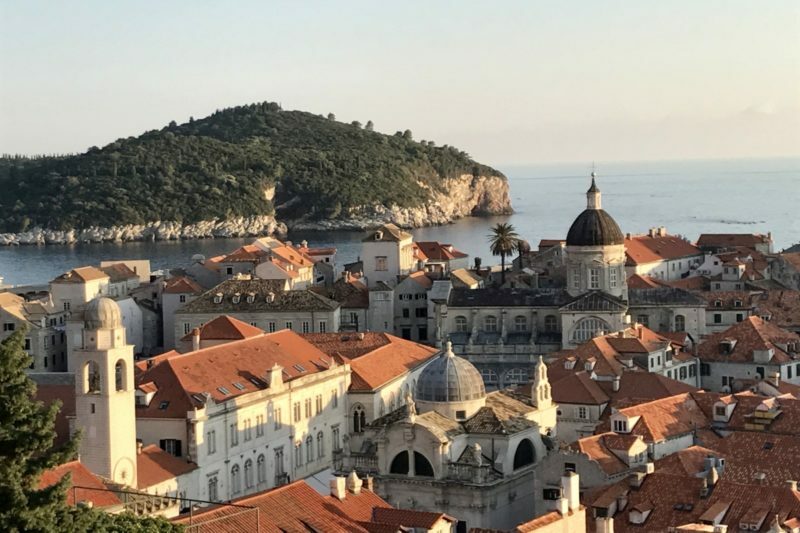 There are many more things to do in Dubrovnik that we didn’t get to. We had a relaxing six days, with plenty of activities but enough time to relax and catch up with Rob and Tavia too. We mostly cooked in our apartments, and spent an inordinate amount or time searching supermarkets for ingredients they just don’t seem to have readily available, like coriander (cilantro)! I have heard so many people rave about Croatia in the past, and I will now be adding my voice to the masses. Lasted between 60 and 90 minutes. Runs multiple times per day, check website for times. Runs at various times in the evening throughout the year. Check website for details. I love to read stories that other write about my country. 🙂 It looks you had a lovely time. Plitviče looks so beautiful! 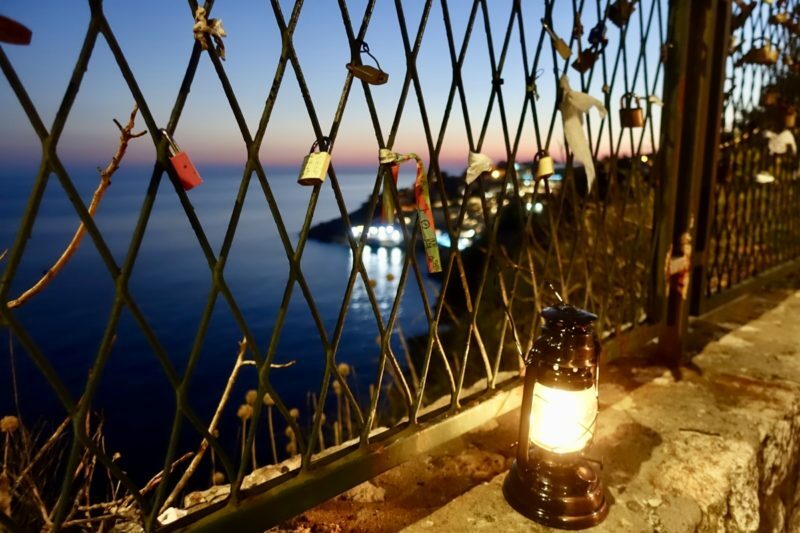 Sad to read how crowded you found Dubrovnik. I was lucky to visit completely off season, in February, and it was much less filled with people. But I also got a much worse weather, so I can see the advantages of not going in the winter 😀 Must have been nice to just takeit easy and catch up with your friends, though! Thanks Eva. We thought the end of September wouldn’t bee too bad, but everyone we spoke to during our visit said this year the tourist season had not slowed down at all from July/August like it usually does. Good in terms of money for the locals, but not great for the crowds. We still enjoyed Dubrovnik. There is plenty to do that is not right in the Old Town. Thanks Madhu. It’s a great place to visit. I can see why it is so popular at the moment. Thanks Sarah. Yes, not great about the stomach bug, but it happens to everyyone eventually I think. The waterfalls really were beautiful. I have so many photos I want to share in my post just about Plitviče Lakes! Am very far from planning a trip to Croatia yet but it definitely looks like a country that must be visited! Clearly, via your post, there are so many sights to be covered. 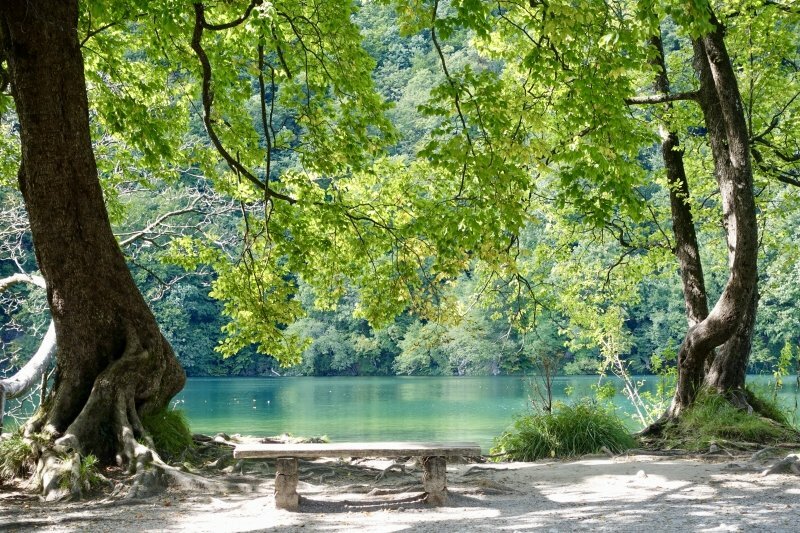 Plitviče looks super amazing, I’ll love to head there first! Croatia is definitely worth a visit It’s getting really busy though so I recommend the shoulder seasons. 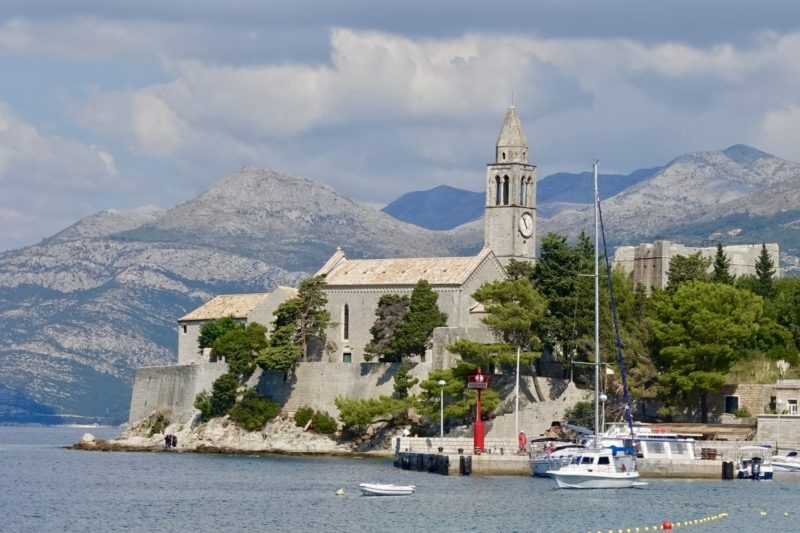 Croatia always looks so pretty – I can see why it is so popular. We’re hoping for a trip in the New Year but we’ll been to try avoid peak seasons. Definitely avoid the peak times. I was surprised it was as busy as it was at the end of September. I hate to think what it would be like in July. Afraid to say that I visited Croatia by Cruise Ship .. but guess I expected the crowds so it didn’t bother me too much. Dubrovnik was probably the hardest because of its size .. but at least we were given free reign so not all in exactly the same narrow street at the same time. 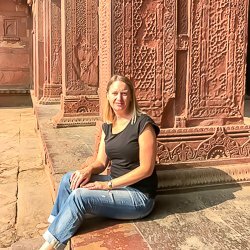 I think this year it was the worst it’s ever been since many of the nearby ports – mostly Turkey and Egypt – have been taken off the itineraries. Even at the end of September there were three or four ships in each day we were at the Old Town. I don’t have a solution, but those streets were not made for that number of people unfortunately! Croatia sounds lovely! Some good tips in here, thanks for sharing! Wow! Josie, that looks fabulous. I don’t know how Paris and Normandy can possibly compete after all this. Are you really going to go back in the winter? Will you be able to carry all the heavy and bulky greatcoats you’ll need? Not this year, but maybe in the future I would like to see some of this area in the off season. Firstly to see some of the places without the crowds, and secondly, how col would the waterfalls all look with icicles around them?? We stayed right in the heart of Dubrovnik for 2 nights and ate out both nights which with hindsight was probably not the right thing to do. Food was the most average and overpriced of our Croatian trip and crowds were overwhelming. Worst supermarkets of Croatia too with very little in them and rude staff. As for herbs, we deducted that the reason you don’t find them in shops is that they all grow them from their backyards/balconies/windowsills! If you looked around gardens you could see basil and coriander everywhere. Agree with the food being the worst and most expensive in Dubrovnik! I know what you mean about the herbs, but I don’t think they use coriander in their cooking much so don’t have it. Rob asked his AirBnB host and she said she had some – and gave us freshly cut continental parsley 🙂 I suppose it looks fairly similar.